Welcome to Kcal, an innovative food and lifestyle company, dedicated to changing the fast food industry as we know it and bringing the world optimal wellness through good, wholesome and healthy food. Our mission is simple. To make the world a better place through outstanding service and healthy, wholesome, fast, tasty food. We have an extensive menu, inspired by firm favourites from throughout the world. We don’t sacrifice on taste and quality and use only the freshest ingredients, as close to their whole and natural state as possible.We operate a strict no-fry policy yet every single dish is bursting with rich flavours, tantalising tastes and health-promoting nutrients. Each dish has been carefully created to comprise a perfect combination of energising carbs, complete proteins, healthy fats and essential vitamins and minerals. As obesity levels reach alarming heights, coupled with increasingly poor eating habits and reduced physical activity, leading to a number of so-called lifestyle diseases such as diabetes and heart disease, never before has there been such a firm call for healthy and wholesome food that optimises wellness and longevity. If everyone takes a healthier and more balanced approach to life, the benefits to be had are far-reaching. We believe that what you eat determines the quality of your life. Quality in, quality out. The better we look after ourselves, the better we feel. Launched in 2010, Kcal is the phenomenally successful creation of ambitious entrepreneurs, Mark Carroll and Andreas L. Borgmann. 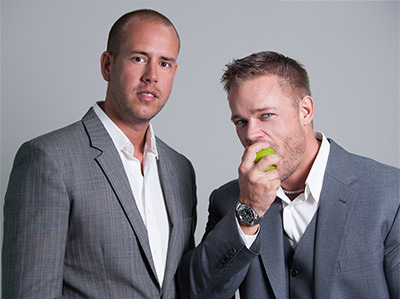 Building on their passion for healthy and nutritious food that was also quickly delivered, and their 10 years of business experience in the Middle East, Mark and Andreas founded Kcal. Unlike most restaurants, Kcal’s menu is built only on healthy, natural and whole, fresh foods. Each dish comprises the perfect combination of complete proteins, energizing carbs and good for you fats. Kcal is today an established and recognized brand name with a reputation for first-class food and outstanding service. The company has grown year over year expanding from a small team of just 12 to over 400 dedicated, energetic and experienced industry professionals, and the pace of growth is set continue in the future! Kcal is an established and recognised brand name with a reputation for first-class food and outstanding service. The company has consistently grown from strength to strength since launch and continues to actively pursue rapid yet controlled expansion both within the UAE and regions further afield. With a solid footprint established in Dubai, Kcal continues to actively pursue rapid and controlled expansion within the UAE and abroad. 2015 has so far seen the much anticipated opening of its state of the art central kitchen facility to significantly expand capacity and efficiency, as well as its first international franchise in Cairo, Egypt. The next stage of growth holds numerous exciting opportunities to expand Kcal’s reach globally.